Garrett Opperman looks to send the ball upfield. The sophomore defender scored in the seventh minute of the game. Northwestern (4-5-4, 0-3-2 Big Ten) played to a 1-1 draw against crosstown rival DePaul (4-6-2, 1-2-1 Big East) at Martin Stadium on Tuesday. Both the Wildcats and the Blue Demons entered the contest looking to end winless streaks of six and four games, respectively. The match started off with a bang as sophomore defender Garrett Opperman headed the ball in off a cross from sophomore midfielder Tommy Katsiyiannis in the seventh minute. After the goal, NU shifted to a defensive approach, giving DePaul time to test the Cats’ back line. The Blue Demons took control of the first half, passing around their midfield and back line before sending balls over the top. Their efforts culminated in a goal off the head of Blue Demons’ forward Jack Richards off a long cross from midfielder Harry Hilling in the 32nd minute. By the end of the half, DePaul had taken 10 shots to NU’s three, five of them by midfielder Zach El-Shafei. The second half began with a steady back-and-forth between the Cats and Blue Demons. Midway through the half, DePaul defender Max De Bruijne went down with a head injury, prompting a fiery response from the Blue Demon bench. Yellow cards were issued to DePaul head coach Mark Plotkin and one of his assistant coaches. After taking a hard landing on a 50-50 ball in the Blue Demons’ box, junior forward Ty Seager was forced to sub out and did not return to the contest. As the half wore on, the Cats managed to maintain steady possession, spending the vast majority of the time in DePaul’s half of the pitch. Despite a near goal by Richards in the 88th minute that forced a diving save from sophomore goalkeeper Miha Miskovic, the match went to overtime. The tactical changes clearly worked. While the Blue Demons outshot the Cats 10-3 in the first half, NU turned the tables on DePaul in the second half, outshooting them 10-3. The first period of overtime started off with tense play by both teams. Midway through the period, Miskovic was forced to run several yards out of the box to dispossess El-Shafei, who was on a breakaway. The second period saw the Cats maintain solid passing around the box, but they failed to connect inside and create opportunities. 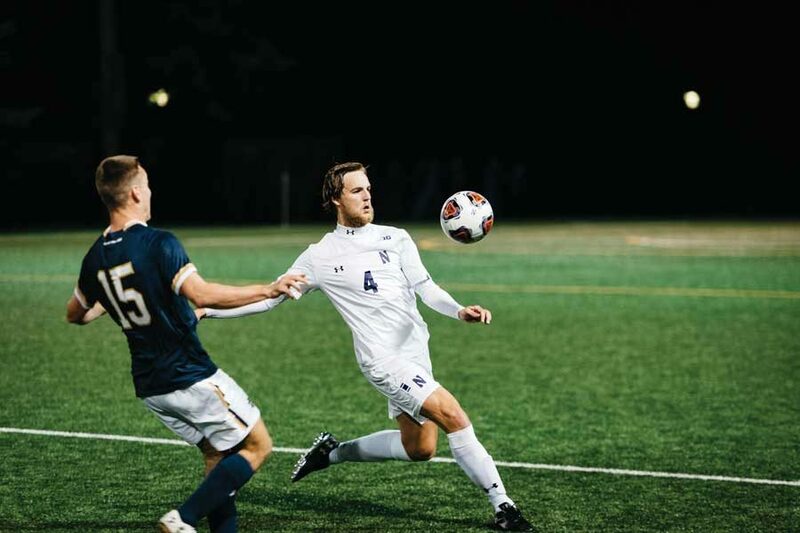 In the final seconds, freshman defender Julian Zighelboim crossed the ball into the six-yard box, where it was knocked out of Blue Demon goalkeeper Drew Nuelle’s hands by Opperman. Junior forward Mac Mazzola deflected the ball into goal to cheers from the crowd, but referee Peter Dhima called a foul on Opperman, negating the goal.